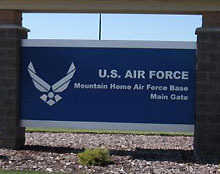 Located on a high desert plateau between two large mountain ranges, Mountain Home AFB is situated about 50 miles southeast of Boise and 90 miles northwest of Twin Falls, Idaho. The city of Mountain Home, Idaho has a population of approximately 16,848. Mountain Home Air Force Base is home to the 366th Fighter Wing, the "Gunfighters." The 366th Fighter Wing is a member of an air expeditionary force. The Wing blends the firepower of F-15C Eagles and the F-15E Strike Eagles, to form a cohesive aerial strike force.